The year 2018 may be remembered as the time when the big pizza companies of America picked sides in the great robot-car race. On one side, Domino’s Pizza Inc. DPZ +0.54% doubled down on a partnership with Ford Motor Co. F +0.09% earlier this year, saying it would be part of the auto maker’s test run for how driverless delivery vehicles would operate in Miami. The two conducted a short test of pizza deliveries in Ann Arbor, Mich., last year. The Domino’s announcement came on the heels of Yum Brands Inc.’s YUM +0.69% Pizza Hut joining sides with Toyota Motor Corp. TM +0.49% in a similar robot-car pact. The partnerships were touted by car companies looking for any edge in the development of driverless vehicles that could transform the way people get around and take deliveries in cities around the world. For the pizza companies, they’re a way to keep up with technology that could make deliveries cheaper and more efficient, potential benefits that have caught the attention of companies in a range of businesses. Most visions of driverless cars have highlighted robot taxis. But many experts are starting to see around-town deliveries as an especially promising arena for driverless cars, and it may even develop sooner than robot taxis. In some ways, deploying a driverless vehicle for packages may be easier than a robot taxi, because designers can optimize the vehicle for safety without worrying about things like hard braking making passengers uncomfortable. They also don’t have to worry about the messy human interactions of a taxi service, such as passengers getting sick in the back seat. In addition, the type of deliveries that are likely to be most common in the early days of driverless-vehicle service—along constant routes during off-peak hours and at slow speeds—reduce the complexity and risk of the autonomous driving, says Rasheq Zarif, a consultant and former head of business innovation at Mercedes-Benz Research & Development North America, in Silicon Valley. “The problem that we are solving has more flexibility” than the challenge of ferrying people around, says Dave Ferguson, co-founder of Nuro Inc., which aims to develop an electric delivery vehicle that has no room for human occupants and instead has special compartments for groceries and other items. Nuro has plenty of competition. Toyota and Volkswagen AG VLKAY -0.58% have both shown early models of electric autonomous vehicles that look more like boxes on wheels than cars. Executives foresee them being used for deliveries. Daimler AG’s DMLRY -0.35% Mercedes-Benz brand has shown a concept cargo van that uses robotics to organize the cargo while the van is in route to make the handoff to the delivery man easier. Artie Starrs, president of Pizza Hut U.S., envisions a driverless vehicle that would allow a person to make pizzas on the way to the customer. Pizza Hut aims to test an autonomous vehicle in the U.S. in 2020 with Toyota, he says. It isn’t just pizza companies, of course, interested in the technology. FedEx FDX +0.01% and United Parcel Service UPS -0.18% are following developments closely, and Amazon.com AMZN +0.60% has a team exploring the technology as well. Juan Perez, UPS’s chief information and engineering officer, told investors last year he imagines the company may one day deploy a fleet of autonomous vehicles each morning that can adjust routes based on weather, traffic conditions and pickup requests. A person would ride along to deliver packages to the door. 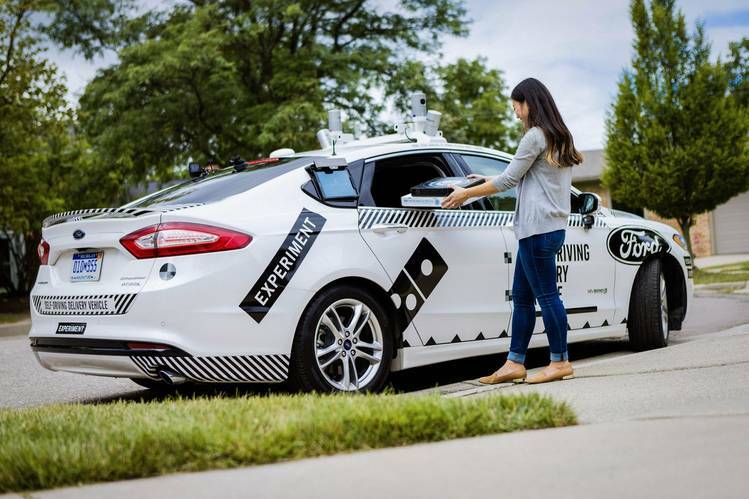 Ford and Domino’s early work has been aimed at trying to understand how customers might interact with a robot car, especially if the vehicle is delivering something without a human on board to get the delivery to the recipient’s doorstep. Last year, the companies conducted a monthlong trial in Ann Arbor, and the big questions revolved around whether customers would be put off by the idea of having to walk outside and collect a pizza from the back of a car. Customers who ordered pizza using the chain’s online app were asked if they wanted to be part of the test. About 100 trips were conducted. For this test, all cars had a driver on board, but the driver was instructed not to take part in delivering the pizzas or interact with customers. The customers were surveyed afterward about the experience. They liked it, the companies said. They liked not having to talk with a human or feeling required to tip, according to Ford. But the test also showed some logistical issues, such as the cars having trouble finding a place to park or navigating to the correct entrance of an apartment complex. And while customers liked the lack of human contact, many still wanted some kind of interaction. “A lot of people wanted to talk to the vehicle,” says Kevin Vasconi, Domino’s chief information officer. Another surprise that highlighted a kink to be worked out: Parents would order a pizza for their children before leaving for a night out on the town. Unfortunately, the robot car was programmed to contact the phone that ordered the pizza to alert the customer that dinner had arrived, a hitch that could result in some failed deliveries. Domino’s commitment to a new round of testing with Ford in Miami is a sign of the pizza maker’s dedication to exploring the technology. “Domino’s believes in a future that will have autonomous delivery vehicles in it, and we want to be a leader in that area,” Mr. Vasconi says.